FLORENCE, Ala. – Four University of North Alabama math and computer-science faculty recently received a $188,000 National Science Foundation Math/Science partnership grant from the State Department of Education to support the first phase of their three-year initiative designed to improve STEM education in Alabama high schools. The principal investigators for the grant are Dr. Cynthia Stenger and Dr. Jessica Stovall, professors of mathematics; and Dr. James Jerkins and Dr. Janet Jenkins, professors of computer science. The team's initiative is called Collaborative Partnership to Teach Mathematical Reasoning through Computer Programming (CPR^2). It uses an instructional treatment the team has been investigating for its effectiveness since the summer of 2012 which merges computer programming and mathematical problem-solving, according to Jenkins. The team found that high school students better understand mathematical concepts when they explore the essential concepts in each problem as a simple computer program, Jerkins said. The grant will provide a vehicle for the UNA math and computer-science faculty to form partnerships with regional high school mathematics faculty. The team is partnering with the Alabama Math, Science and Technology Initiative (AMSTI), a State Department of Education program designed to improve math and science education in Alabama. 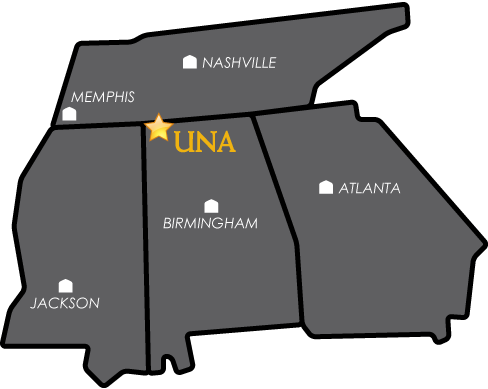 UNA’s East Campus is the AMSTI host for northwest Alabama. The grant was awarded March 1. It will fund on-site training visits for 24 northwest Alabama high school teachers, an interactive web community for instructional support, and the cost of hosting a two-week professional development seminar at the AMSTI in-service center this summer. For more information, contact Tanja Blackstone, director of the Office of Sponsored Programs, at 256-765-4523 or by email at tfblackstone@una.edu.